Okay so who wouldn't love Lucy? I have some more pictures of her that I need to scrapbook but figured two layouts, another which I will post tomorrow, is a good start. I found this paper at Big Lots. I think it might be DCWV. I got the pack for $5 and it had paper for dogs and for cats. Which when I feel like I can scrap pictures of my beloved "boys" I will use the cat paper then. But I am still not in the place where I feel like I can do that without crying. But this post is about my lovely Lucy LuLu. There was nothing really "special" about the pictures other than I thought they were good ones of Lucy. I used Paper Pups for all the cuts on the layout. 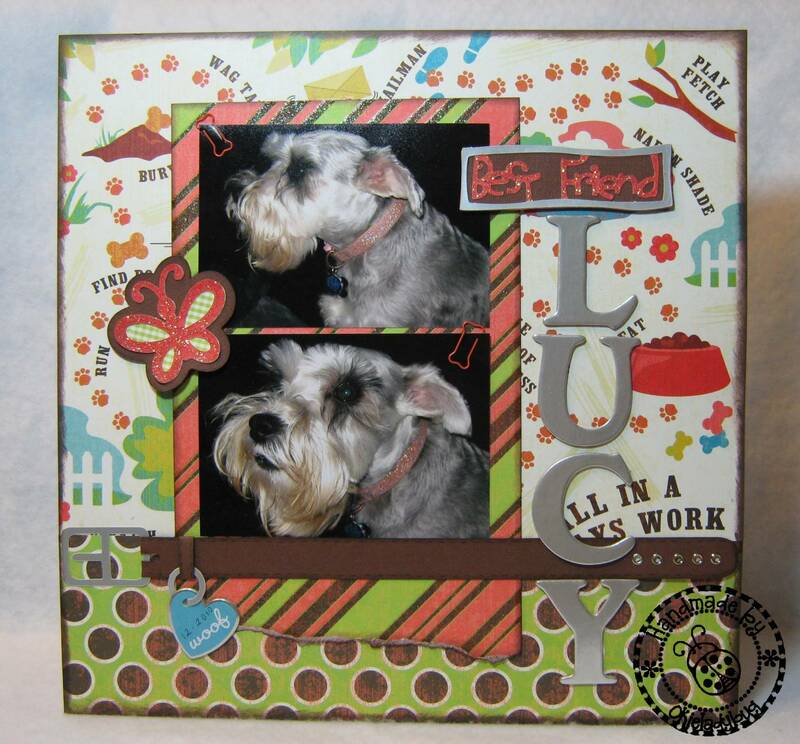 I don't use this cart enough, but then again like I said I haven't scrapbooked many of the pictures I have of Lucy...YET! There are some great things on the cart even if you don't have a dog. I actually traded for this cart years ago. I ended up with an extra ATG gun and traded it for the cart. I got the "map" for the layout from PAGEMAPS and where it had ribbon I cut a dog collar to place in that spot. I was able to use Design Studio to get the color to just the right length I needed to reach across the page. I think it turned out really well. I did add faux stitching along the sides to make it look a little more realistic. I was going to sew but I was too lazy. 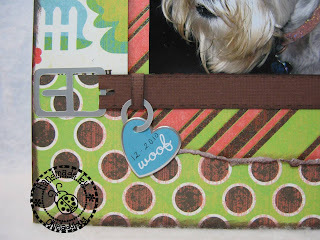 I found this little woof heart tag in my embellies stash and thought it worked well with the collar. Since I didn't do any journaling on this layout I just added the date on the heart tag. On the other end of the collar I used silver eyelets to add to the holes. I was lucky that the cuts were perfect for my 1/8" eyelets. I added Fruit Punch Stickles on the Best Friend and also on part of the butterfly that you can see on the full layout. 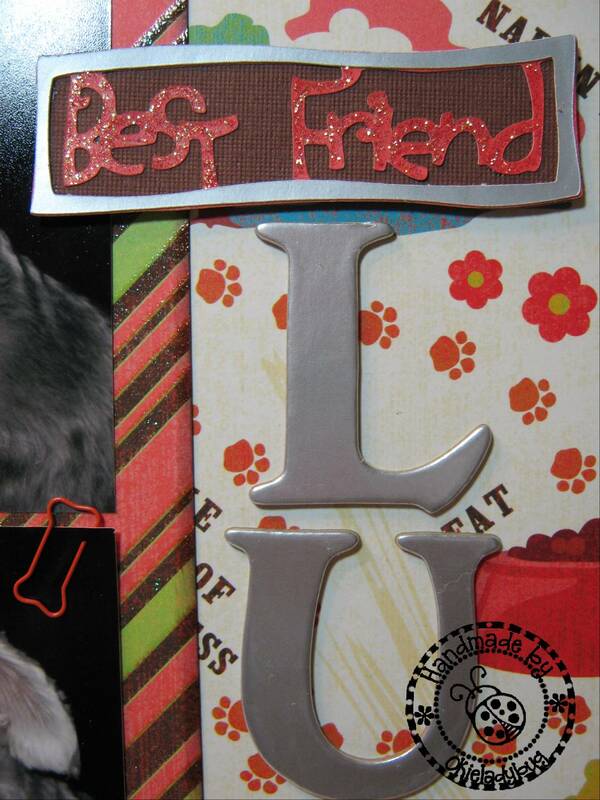 The large silver letters are from Bare Elements and I got them when I went to the Great American Scrapbook Convention in Arlington Texas with Linda, aka LGuild and Karen, aka BFF Karen. We had a blast and Linda and I are looking forward to going this year and hoping to meet up with Carmen, aka ScrapperDelighted *okie is beginning to think her friends are all spies or something since they all have aka's on their names*. I also found some little dogbone paper clips in my embellies stash that I thought worked well with the layout. I will be featuring Lucy tomorrow as well! Lucy is adorable! She does deserve this beautiful and thoughtful LO! Congrats, Okie!! Great layout and wonderful pictures of your beautiful Lucy! She reminds me of my Grandmother's beloved schnauzer, Teddy. TFS, Okie! Lucy is so cute!!! We have the same breed. Actually she belongs to my in-laws but I Eiffel is like my daughter. They are such good, loyal and lovable dogs. Your layout is beautiful too. The paper is adorable. Great LO, love your embellishments on this one! What an adorable fur baby Lucy is! WOOF! 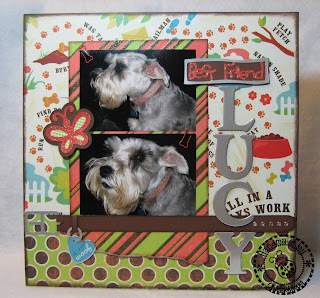 Great layout... We have two dogs and I scrapbook them all the time. So much fun to create pages for them, oh my kids too!!!! Lucy looks serious in these pix. Hope you have one of her with her smile to scrap too. She's only the second dog I've ever seen that could actually smile! Cute layout - and I love Lucy! She's adorable; I had a schnauzer growing up. He lived a good life. Brings back memories. Great job! Sweet layout...so bright cheerful...even Lucy has a smile. I love Lucy too! What a cute pet and a darling page layout. what a sweet layout! those papers are perfect!